Hope everyone had a great holiday. 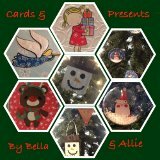 I just wanted to share with you real quick the cards and the ornaments that my super creative nieces made. For the past two years, I have been taking both of them and helped them make cards and gifts for their parents and grandparents. This year, my younger niece, Bella, requested to come on her own and it was much easier. SInce they are two different ages, it was easier to tailor the gifts and card making to each one’s abilities and styles. Last year they did a joint gift for their Nona and Pop-Pop, but this year I had them make separate things. So, here are the things that they created. I think that they did an amazing job and I am always fascinated at the ideas they have for their gifts and cards. Great job girls!! Posted in card making, ideas and tagged Christmas, Cuttlebug, divine swirls embossing folder, embossing, gifts from kids, handmade cards, handmade gifts from kids, handmade ornaments, MFT dies, MFT stamps, Michaels, ornaments made from popsicle sticks, paint, penguin ornament, popsicle stick presents, reindeer ornament, snow from dollar store, snowflake paper, snowman ornament. Bookmark the permalink.